What days are teacher-led field trips available? How early should I book a field trip? Field trips must be booked in advance and are available on a first-booked, first-served basis. We encourage you to schedule your field trip as early as possible. What will I get when I book a field trip? What teacher-led curriculum is available? Note: Each lesson will have a pre- and post-visit activity. All activities and curriculum align with Oklahoma Academic Standards. There is no minimum number for booking a field trip. You can bring as many students as you’d like pending enough chaperones. How many chaperones will my group need? All Gathering Place field trips are free of charge. How do I know my field trip is booked? Once your field trip is entered into our reservation system, you will receive a confirmation email. Your field trip is not booked unless you have a confirmation email. If your field trip cannot be booked due to a scheduling conflict, you will be contacted by the field trip reservation team. When will I be able to book a guided field trip experience? How early should we arrive for our field trip? Please arrive 15 minutes before your scheduled start time. This will allow time for bus drop off and parking. Will we be able to explore the entire park? Yes, the entire 66.5 acre park is available during field trips, unless closed for maintenance. We encourage your group to come with name tags or school t-shirts to easily stay together. What if I need to cancel my field trip? Please notify us two (2) weeks before your scheduled field trip. This will give us a chance to fill your spot with another class. Please email [email protected] to cancel. Gathering Place will respond via email to confirm cancellation. Where do I put all of my stuff when we get there? Gathering Place does not have any storage areas for field trips. Please plan to keep any lunches or personal items with you or in your vehicle. The Field Trip Map has information on bus drop-off/pick-up spaces, bus parking, and chaperone parking. Reference the Field Trip Map for lunch spaces and restroom locations. Full park maps are available at Guest Services in Williams Lodge and in the ONEOK Boathouse. If you need immediate assistance at the park, find an Attractions Host in Gathering Place uniform. Our Operations team fully staffs all areas of the park. If you need to contact security, please call 918-947-6223. Lost and Found is located at the Guest Services window in Williams Lodge. Is there WIFI available at the park? Free WIFI is available in Williams Lodge and ONEOK Boathouse. There is not WIFI park-wide. Additional wristbands are available at Guest Services in Williams Lodge. Field Trip and other booked groups are not allowed to participate in Boat Rentals at this time. No amplified sound devices; please use headphones to enjoy your music. No pets other than service animals are allowed in play areas unless otherwise authorized; Pets are allowed, leashed, on the Midland Valley and Riverside trails and during designated days as published. No smoking permitted (traditional or e-cigarettes) except in designated areas. No transport devices larger than a child’s wagon (other than wheelchairs). Skates, skateboards, scooters, roller blades, bicycles and powered ride vehicles (except for ECVs used by mobility-impaired guests) are allowed only in designated areas. Rock and structure climbing is prohibited unless designated; please ask a Gathering Place staff member if you have any questions. The open or concealed carry of guns, knives or other weapons is strictly prohibited. No drones or other radio-controlled equipment are to be operated at Gathering Place. The Chapman Adventure Playground closes at dusk every day. Picnic Grove and the Great Lawn are available on a first-come, first-served basis. Gathering Place does not have any storage areas for lunches. Please plan to store them on your bus. Outside food and non-alcoholic beverages are allowed in these spaces, but no glass is allowed at any time. Williams Lodge, The Patio, and ONEOK Boathouse do not have lunch spaces available. During inclement weather, it is recommended to eat on your school bus. Gathering Place has limited indoor spaces for field trip groups. 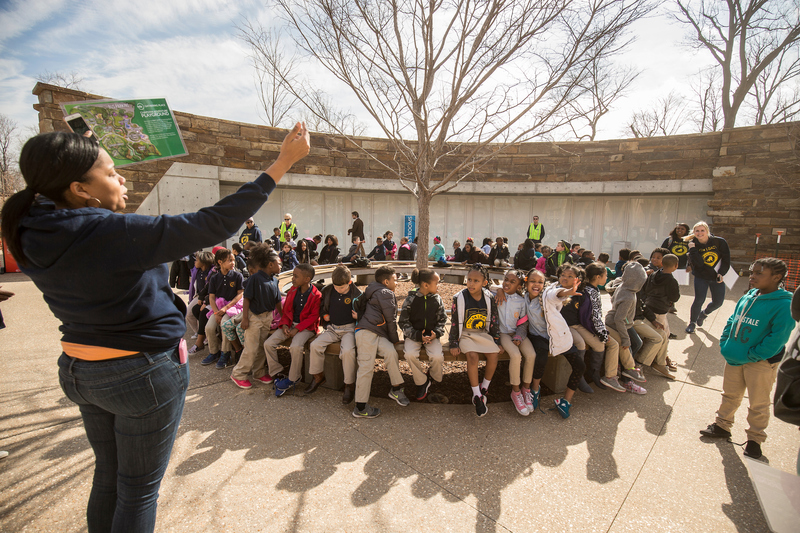 Gathering Place does not cancel field trips due to inclement weather. If Gathering Place should close for any reason, our reservations team will contact your group via email and phone. Gathering Place cannot accommodate indoor space for field trip groups during rainy or cold weather. Please keep the weather and time of year in mind when scheduling. In case of emergency weather situations, there are multiple indoor areas to take shelter.